Marriage License Fee in Cash to agent ($65.00) U.S. Funds. The agent will give you the marriage license. Make sure the marriage performer is commissioned by the State of Hawaii, Department of Health. Couple presents marriage license to marriage performer. Marriage performer, couple and witnesses sign marriage license form which then becomes the marriage certificate. A marriage license and marriage certificate are different documents. The marriage license permits a marriage to take place. The marriage certificate indicates that a legal marriage has been performed. The marriage certificate is prepared and filed by your licensed marriage officiant or performer with the Department of Health. 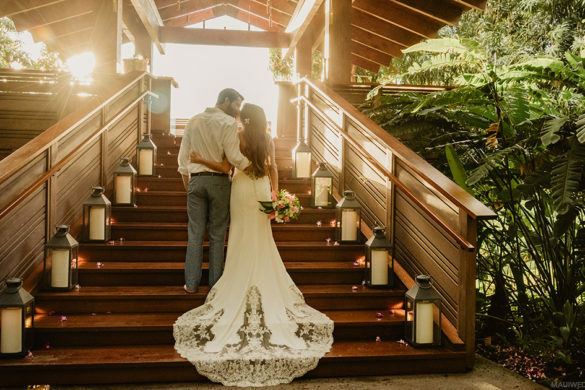 A newly married couple receives one (1) certified copy of the marriage certificate at no extra charge, upon payment of the marriage license fee, which will be sent to the couple by mail (60-120 days) after the marriage has been performed. If a marriage certificate is needed sooner than this, you can apply for one or more additional certified copies. Males or females of 15 years of age who wish to marry require the written consent of both parents or legal guardian, and the written approval of a judge of the family court. The parents or legal guardian do not have to be residents of the state. Consent forms may be obtained from a marriage license agent. Proof of age is required. A certified copy of a birth certificate must be presented for anyone 18 years of age or under. A valid I.D. or driverï¿½s license may be presented for anyone 19 years of age or over. The prospective bride and groom must appear together in person before a marriage license agent to apply for a marriage license. Proxies are not allowed. The prospective bride and groom must prepare an official application and file the application in person with the marriage license agent. Applications are provided by the marriage license agent or may be downloaded from this site (see below). The application will not be accepted if sent by either postal mail or e-mail. The fee for a marriage license is $65.00, payable in cash at the time the application is made.